Apply to Lutheran Family Services Rocky Mountains (LFSRM) Submit necessary paperwork to initiate direct services in Colorado. Complete an application with the International Primary Agency of your choice. Complete the Home Study process with LFSRM. This includes: home visits, reference checks, background checks, and physicals. Work with your International Adoption Agency to finalize all international paperwork. This includes the Dossier, in order to send to the country from which you are adopting. Travel to country to pick up your child and return to the U.S. Complete post-placement supervision with your LFSRM counselor. This will vary based on specific state and country requirements. 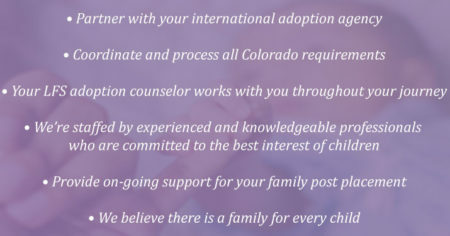 Re-validate or finalize adoption (country dependent) in the State of Colorado through the court system in order to receive a U.S. Birth Certificate for your child. For any questions or clarifications, please contact us at 303.217.5863 or send us an email. The Annual Report for the State of Colorado is available on request. The report covers the last three calendar years. It includes the number of parents who apply to adopt on a yearly basis, the percentage of placements that remain intact, are disrupted, or are dissolved.